Karen Schmidt is passionate about helping team leaders maximise the engagement, confidence and performance of their teams. 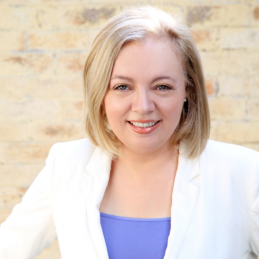 She has helped 1,000s of team leaders in Australia, New Zealand and South East Asia over the last 20 years working with corporate, small business and not for profit clients. Karen offers practical advice to help team leaders identify their strengths and use them to engage with their teams…. Karen offers practical advice to help team leaders identify their strengths and use them to engage with their teams. The result is they increase their competence and confidence. Organisations benefit from the higher productivity, lower turnover and more innovation. With a background in Human Resource Management, she holds a Bachelor of Adult Education degree and is the author of 5 books including her latest “Thrive: How team leaders can double their team’s engagement, confidence and performance”. Karen is an authentic, engaging and interactive speaker who uses metaphors to deliver messages that change how team leaders show up in their role. An experienced speaker who has presented in 8 countries, Karen is a Certified Speaking Professional, a title held by less than 10% of speakers internationally. Every organisation wants their team leaders to go from surviving to thriving in their role. It easy to make that happen when they master three simple mindset shifts that will see them stress less and achieve more. Leading a team today can be hard work if you don’t have the right foundations in place. If you can master 5 basic skills you will find your problems decrease and your team naturally start to grow. Using the metaphor of a garden Karen offers some grassroots advice for leaders and aspiring leaders. There are always going to challenges when you lead. If you want to be in the driving seat and take advantage of the opportunities they present then you need to develop a plan and get your team prepared for the road ahead. If you’re ready to take a step up in your leadership career stop being a team player and start being a collaborator. Discover how partnering with people inside and outside your organisation can boost your success. Collaboration is like dancing with a partner: it can be beautiful if you get it right! If you want to see your organisation thrive then you need to rethink the way you develop your team leaders. Discover the 3 essential skill sets they need and how to deliver them using a 4 step model that creates real behavioural change.